Champion Honda GL1800 Goldwing Trike Conversion Kit. Lehman GL1800 Goldwing Trike Conversion Kit. LLS Lehman GL1800 Goldwing 2012 and up..
Roadsmith HSCR 1800 Honda Trike Conversion Kit. HSC1800 is simply a "purpose built" cruising machine. -For the VTX1800R and S models. Lehman GL1800 Goldwing pre 2012 Trike Conversion Kit. Champion Honda GL1500 Goldwing Trike Conversion Kit. The HSC1800 For the VTX1800R and S models. Champion Honda VTX1800 Trike Conversion Kit. Roadsmith HSC1300 Honda Trike Conversion Kit. -For the VTX 1300 R and S models. Champion Honda VTX1300 Trike Conversion Kit. 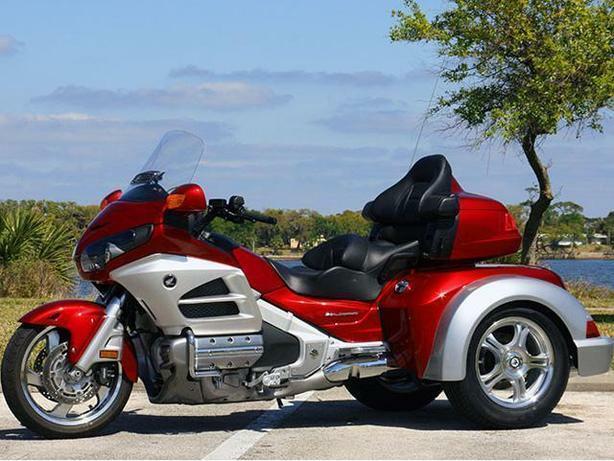 Lehman Honda F6B Trike Conversion Kit conversion kits include the Monarch II LLS and the Monarch II.